Jack and Lisa Marshall, lifetime local residents of the Marysville community, believe wholeheartedly that the simple joys in life are what make it all worth living. Applying this philosophy to Lisa’s favorite indulgence seemed only natural. 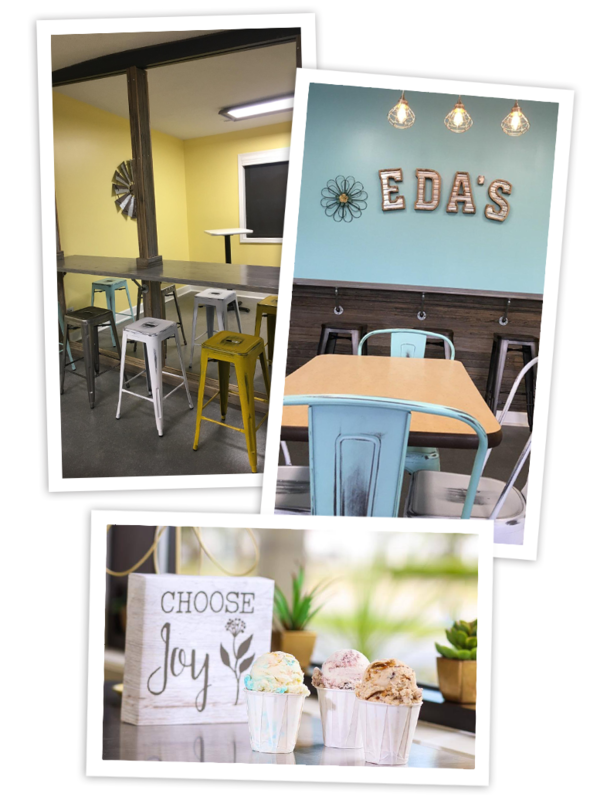 Eda’s Italian Ice pairs the best of it all–simple, delightful desserts that are filled with flavor and a welcoming, vintage-inspired atmosphere, comfortable for any time of day. Eda’s Italian Ice is smooth and light, while our Gelato makes a statement with its intensely creamy texture (and is wonderfully 90% fat free!) All of our Italian Ice and Gelato offerings are produced on-site daily, so they’re always fresh, tasty and full of Joy. It is truly our pleasure to provide our community with these deliciously tempting treats and to bring Marysville a bright little dessert destination spot. We hope you’ll join us and experience some “Joy in a Cup” for yourself!